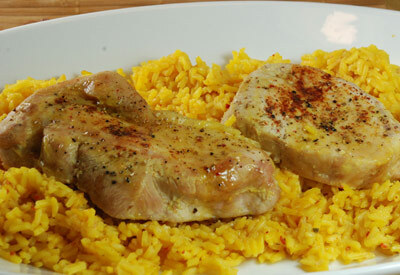 Sweet and tangy chops served over a bed of yellow rice makes a colorful meal! In a small bowl, stir together mustard and honey. Spray each sheet of foil with cooking spray and place a pork chop in the center. Pour 1 Tablespoon honey mustard over each chop (take care not to touch the raw pork with spoon or honey mustard container). Reserve remaining honey mustard to serve with the meal. Sprinkle pepper and chili powder over each chop to your taste. Fold foil over, enclosing contents completely and crimping edges tightly to seal. Place packets on a baking sheet and bake until the chops are no longer pink, 18 to 20 minutes; do not overcook. Serve immediately with reserved honey mustard.